Every day, thousands of businesses are either moving or expanding their business offerings into the virtual space. The dot-com boom not only changed the world of retail but also foreshadowed changing consumer trends as the world began to truly embrace technological change. As smartphones, laptops, and iPads became a part of daily life, businesses shifted their efforts into the online space in order to utilize such fantastic technologies. This mass movement to the online marketplace and the e-commerce boom which resulted from that exodus has changed customer expectations and behavior. The closing of shopping malls across America epitomizes the trend that people shop in person less, and prefer the convenience of shopping for practically anything on earth, at home, from the comfort of their couch. These days, if you own a business, it’s vital you create a website displaying your offered goods or services. Regardless of whether or not you fall under the e-commerce umbrella, customers now expect businesses to have their own website. Whether you are a plumber or a doctor, a website grants your business a form of legitimacy amongst many other things. If you have never previously crafted a website, it can be a daunting task trying to understand all of the various elements involved, especially for those who are not computer savvy. There are a ton of technical terms and it can seem overly complicated, but rest assured, it is not that difficult to comprehend. Today, we will focus on distinguishing the difference between a website and a domain. We will then discuss why both are important for your business and we’ll end with how you can start the process of domain name registration. To distinguish between websites and domains, we will first dive into the former. A website is a collection of web pages and multimedia content, which may be accessed through a device such as a laptop, smartphone, or another device with access to an internet connection. A web page is the physical manifestation of these documents and is what appears on the screen when you click a link, enter a web address or query via a search engine. Web pages may display a variety of information and data, as well as sound, animation, text, color, and graphics. Websites can be multifunctional and may be used at their owner’s discretion. They can be used to represent governments, individuals, organizations, or corporations. They are generally meant for a specific task, be it selling a good or service, entertaining, social networking, or educating. Every one of these publicly accessible websites makes up the World Wide Web. When you receive a person’s web address, this generally leads you to their website home page. The home page acts as the welcoming screen and construes what the site is contributing in terms of goods, services, or information. From the home page, a person may click on links in order to travel to other pages of the website. To do: Online visitors surf the web for a variety of motivations such as killing time, looking for entertainment, seeking to buy an item or service, communicating with others, interacting with social media, or paying a bill. To learn: We have access to the entirety of the world’s knowledge through a small device we carry in our pockets. People visiting websites may do so to find a movie time, clear up an argument, or locate the address of the nearest gas station. At its essence, a website is your way of communicating who your business is to consumers that you will likely never meet in person. When creating a website, it is important that you know your audience and cater your website towards them, towards what they want and need. A website is not only meant to attract people to whatever it is you are trying to sell but to help convince them that they need whatever that is. Therefore, it should be organized in such a way that it is pleasing to the eye, easy and intuitive to navigate, and clearly conveys what you are providing. Now, what is a website domain name? 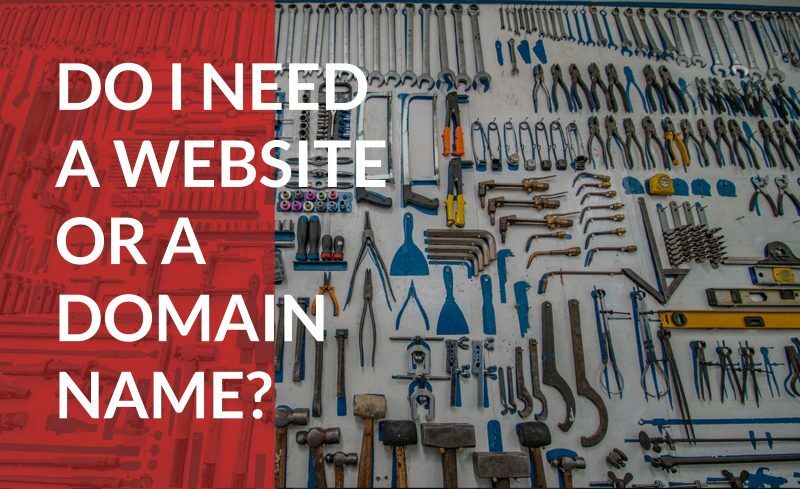 When thinking about websites vs. domains, it is essential that you remember that websites act as the online storefront that potential consumers will peruse, and that storefront is made up of a variety of things such as pictures, files, data, and pages. When a computer communicates with another computer, it does so in a similar manner to how we travel from place to place. We start at a beginning point, then follow roads and directions to that final destination address. Computers act the same and in order to reach that desired endpoint, they require an address system to distinguish one computer or server from another. In the early 80s, computer scientists, under the auspices of the American government and military, began constructing the world wide web. This computational network allowed computers to speak amongst each other and allowed the user to visit websites by physically entering their numerical address. The categorization system they created to assign unique 32-bit digits to each device or website was called the Internet Protocol Address System. Colloquially, we now call this the IP address. This system was a step forward, but not ideal, especially as more websites and computers were gaining access to the world wide web. In order to avoid having to memorize or compile a list of randomized digits comprising your favorite websites, computer scientists created the Domain Name System. Within this system, a website owner could register a name, if available, that could be used as a substitute for the IP address. After a domain name is acquired, you have the option to decide whether to use it for one or both email services or web services. You also have the option to simply rent the name and hold it like you would an investment. It should be mentioned that registering a domain does not also somehow create a website, rather it creates a name that can be tied to that eventual website and its IP address. .com: abbreviation of commercial, .com was made for commercial use and is the most commonly used top-level domain extension. .org: abbreviation of organization, .org was intended for nonprofits. Over time, it have been used by schools, nonprofits, and for-profits. .net: abbreviation of network, .net was made for internet service providers and network technology companies. Over time, it was adopted for commercial use. .edu: abbreviation of education, .edu was made for American institutions of higher education. .gov: abbreviation of government, .gov was made for American federal governmental personnel and agencies. It is now used by governmental agencies, on both the state and federal level. .mil: abbreviation of military, .mil was made for the various American military branches and their service members. Your contact information: first name, last name, home address, phone number, and email address. URL Forwarding: Redirect traffic from one domain to another. Email Forwarding: Automatically forward emails to other valid email addresses. DNS Management: Retain total control over your DNS records. Hosting a website differs from registering a domain in that hosting involves renting the space where the webpage will be hosted, while domain registration is the name or the location of that space. Once a website is created, all the files and information needs to be stored somewhere, especially if you expect traffic to the site. A web host will carry all of your website’s content for potential internet visitors. Even though the site itself is digital, those files require storage on physical servers. Here at Domain.com, we offer web hosting services. We offer a variety of plans that are tailored for your need and expected traffic. Should I use Domain.com for foth domain registration and hosting? Keep it simple: While you can utilize separate services and employ different platforms to host your website or register your domain, it is much easier to bundle the services. In such cases, everything is consolidated, and changes can be made instantly all in one place, rather than jumping back and forth between platforms. Link domains and websites: When you use Domain.com for both services, we make the linking of the domain to a website a seamless and hassle-free process. Centralize expenses: Both of these services cost money. By registering and hosting through Domain.com you can keep track of your accounting and other information all in one place. There are a variety of differences between a website and a domain, but both are vital components to creating a successful online presence. Your online success starts with a fantastic domain and an equally impressive website.